Sheets fit comfortably. I was happy with the speed of delivery. After I washed then they were so soft and the fit couldn’t have been better had I made them myself! Thank you for your very accurate description and return policy! Enjoy the soft and serene percale of this cotton sheet set. Your choice of delightful colors and patterns will enliven and uplift your sleep space with lasting cheer and breezy sophistication. Excellent sheets! 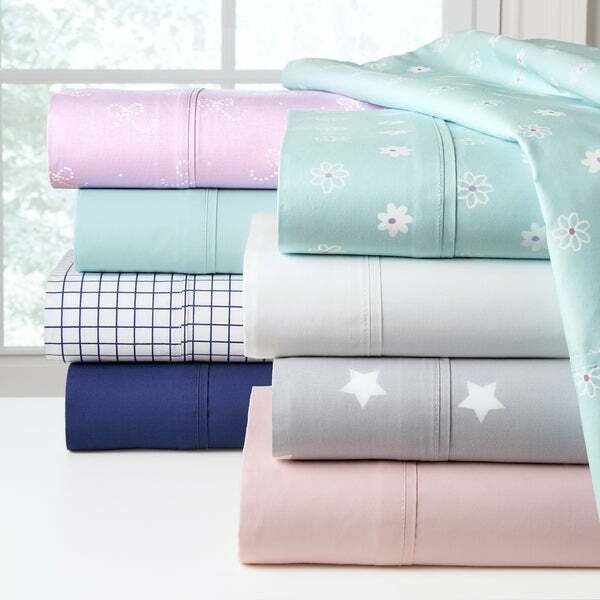 I love good quality sheet sets that are not horribly expensive, and these are a great example. We spend such a large portion of our lives in bed, we owe it to ourselves to have good, quality bedding. Theses are comfortable to sleep in but the ends of the top sheet and pillow cases wrinkle under and have to be pressed after drying. I bought these sheets to go with the Lullaby Bedding Airplane Duvet Set and it goes very well together. The pillow cases and edges of the sheets wrinkle a bit, but no one sees them except for my 7 year old and he doesn't care. Very nice sheets. The sheets are soft and the color is vibrant...even after washing. Very nice cotton sheet set. I purchased them for my 7 year old daughters bed. I definitely recommend them. Would definitely purchase the other colors. Wonderful feel to these sheets. Crisp yet soft. Darling pattern. Can tell they will last a long time. Would definitely recommend these sheets. Quality is like I haven't found for a long time. Love these sheets. Crisp clean sheets that are so comfortable to sleep in. I don’t like all the slippery high thread count sheets. These are perfect for me. And the corner pocket size is great for my bed. The bottom sheet stays perfect. These sheets are wonderful! The queen set fits my queen mattress with a fairly thick mattress pad on top. Soft and haven't faded in the wash. I really like the feel of these sheets - they have a good weight to them, and they wash and dry nicely. The color was exactly like the picture, so that was good too. Sheets are good quality, has a nice crisp airy feel. Still course after 10 washings! The color was nice (so they get 2 stars instead of just 1) but they just never got even close to comfortable enough for a good night's sleep, let alone a nap or to read in bed on. Even tried washing them with sodium bicarb and nothing made much difference. Ended up in a donation pile where hopefully, someone will be able to use them to make sails out of or something. The picture displayed for the "Stars" Queen sized sheets are not even remotely the same as what was sent to me. Sent back for an immediate return. This is an Overstock fail. These sheets are so comfortable and they actually feel better with each washing. Great sheets for a great price! They are super soft and very comfortable. My husband loves them. I purchased the grey sheets with the white stars! I love Stars, and my bedroom is different shades of grey with bright accents. These sheets are nice and crisp. I've used them for quite a while now and they've held up very well with washing. I definitely recommend them! Great sheets, great value. Not too crisp, not too limp. The colors are just as shown. Sizing is accurate. Quick shipping, as always. I’ll be buying another set soon. Beautiful colors and they fit perfectly. "How "extra deep" is the pocket for King size?" The fitted sheet fits up to 17-18-inch deep mattress. "Are these sheets 100 percent cotton percale or do they have polyester or some other fiber?" These are 100% Cotton percale sheet sets. No Polyester or any other fiber. They are percale, so they aren't microfiber. Percale sheets are what I personally consider "traditional" sheets. They are sort of cool and crisp. I bought these for my daughter and she loves them. I've never actually slept in her bed, but they feel really nice and they wash really well. "Where is this sheet made"
"I want to order the grey with white stars. The names do not indicate this sheet. How can I figure out the name this set is under ? " I wanted plain blue cotton sheets. These are what you had.